Alexander McQueen launched the Fall/Winter 2013-2014 eyewear collection with two key new styles. The collection reinterprets the signature features of the House’s accessories in a unique way, from the cascade of metal studs to the distinctive detailing of the “Heroine” bag. Women’s soft square sunglasses inspired by Alexander McQueen’s signature “Heroine” bag’. The front has two slim openings featuring an acetate and metal insert, giving this model a dynamic yet elegant look. A sophisticated colour palette combines black and blue; burgundy and black; black and havana; havana and black. 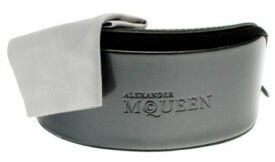 Our Alexander McQueen sunglasses are brand new and guaranteed to be 100% authentic!